Go to most grocery stores and look at the snack bar aisle. Ay yi yi. Granola bars as far as the eye can see, in all sorts of variants. That's all I remeber from growing up. These days, though...Clif Bars, Luna Bars, Larabars, fruit/nut/seed "protein" bars, heck even Gatorade bars. It's apparent we love these lil handy snack buggers. So of course, here's another entry into healthyish snack bars, and as an added bonus, it's another TJ's style attempt at copying off a more famous brand with only subtle differences. 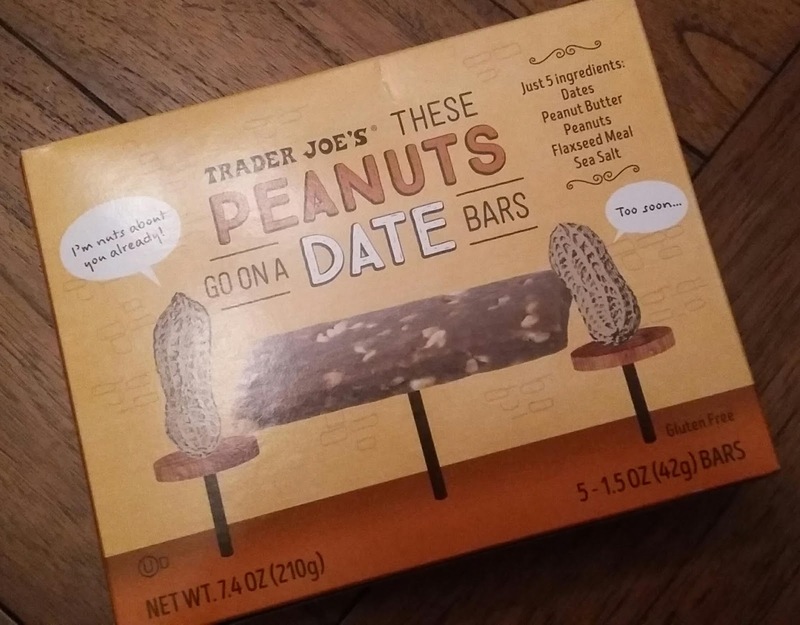 This time, it's Trader Joe's These Peanuts Go On A Date Bars. Let me get this out of the way: the name bugs me, and I can't figure out why. It's cutesy with the cheesy pun (we expect nothing less, Big Joe) that makes for an easy illustration, and as far as I know it's grammatical, but...I don't know. It doesn't sound right. Maybe they could have been called Nutty Date bars, and for a picture, have my high school girlfriend on there...but I digress. The closest mainstream snack bar to these TJ's nutty daters would be, of course, Larabars. Dates and nuts as the base for a on-the-go grubber is pretty standard and shared between the two. But there are, of course, differences. I've had Larabars with dates and peanuts in them, but to my knowledge, none with "peanut butter" also listed. There's not a huge difference tastewise, except maybe the TJ's bars being slightly less datey and slightly more nutty, but man, the feel is different. TJ's are much softer, almost limp, comnpared to the usal firmness of a Larabar. I can sense it being a textural challenge for some, for sure. But yeah, other than that: Dates. Peanuts. Flax seeds and sea salt, which don't do much in my opinion. Whoomp there it is. Nothing exciting. They are a decent value compared to Larabars, which I'm accustomed to seeing at roughly a buck a pop. TJ's box o' five is $2.99, so not bad, and easier than making your own - I know, I've tried, and I have the burned out blender to prove it. They're worth a try if Larabars are your bag, if not you'd be happier skipping. Kinda meh all the way around - not great, not awful, which is alright with me. they’re certainly softer, a little thinner and more sticky than larabars. Really tasty and certainly good savings vs larabars which are more like $2/ea at other stores.